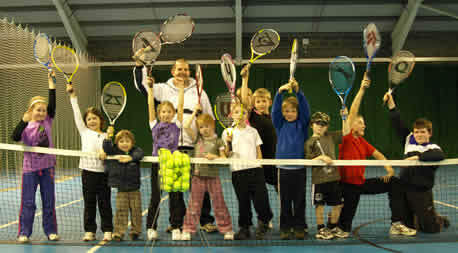 Ilkeston Tennis Club have a large programme of junior coaching sessions and social play. 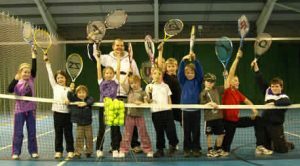 Tots Tennis (Age 3 -5) (Racket size 19-21”/50-54cm) Tots Tennis is a lesson that’s designed to help improve coordination and dexterity, balance and fundamental tennis skills. Children will learn basic tennis shots; however the main focus of the sessions is to improve balance, movement and coordination to enable children to fulfil their potential as they progress through the mini tennis levels. Mini Tennis Red (Age 5-8) (Racket size 19-23”/50-58cm) Mini Tennis Red is played on a modified badminton court or approximately 1/4 of a full size tennis court. Using a lower net, smaller rackets and sponge balls, it enables children to gain a good understanding of basic tennis technique as well as the ability to serve, rally and score. Mini Tennis Orange (Age 8-9) (Racket size 23-25”/58-63.5cm) Mini Tennis Orange is played on a 3/4 size tennis court with a lower net and low compression balls. Children should ideally have mastered Mini Tennis Red before moving onto this level. Sessions will include technical and tactical coaching as well as point play to enable players to improve. Mini Tennis Green (Age 9+) (Racket size 25-26”/63.5-66cm) Mini Tennis Green is played on a full size tennis court, with slightly lower compression balls than the full game of tennis, yet higher compression than Mini Tennis Orange. Players will ideally be expected to have mastered Mini Tennis Orange before moving onto this level. Junior Improvers (Age 11+) (Racket size 26”/66cm to full size) Junior Improver coaching will incorporate all aspects of tennis and now allows players to use full compression tennis balls due to their ability, age and size. This is ideal for older players that may have not completed the mini tennis programme or have limited tennis experience. Junior Intermediates (Age 13+) (Full size Rackets) This session is for very competent tennis players with experience in matches and competitions. For more information on intermediate sessions please contact the Head Coach. Please note that recommended ages for sessions are a guide and ultimately ability and experience will determine the most appropriate session for each player. Rackets can be provided for all sessions. All courses run with school term times and are charged per half term.